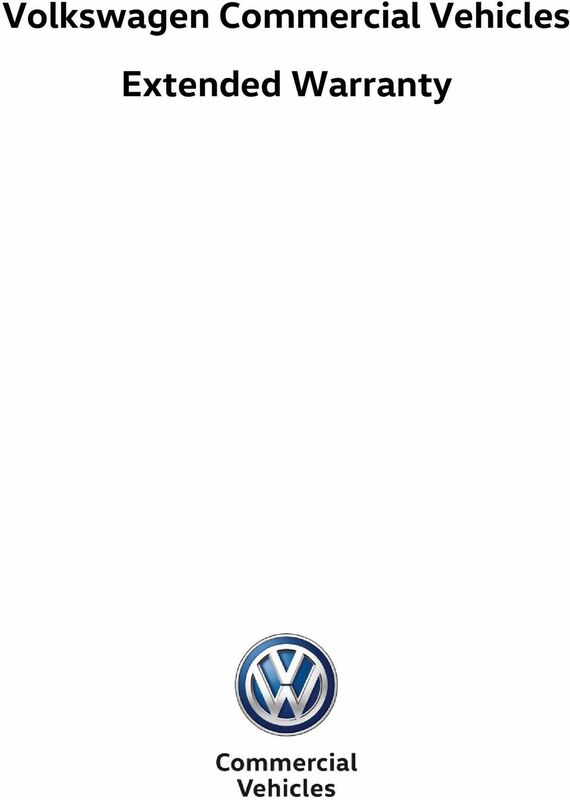 Download "Volkswagen Commercial Vehicles Extended Warranty"
3 this document. 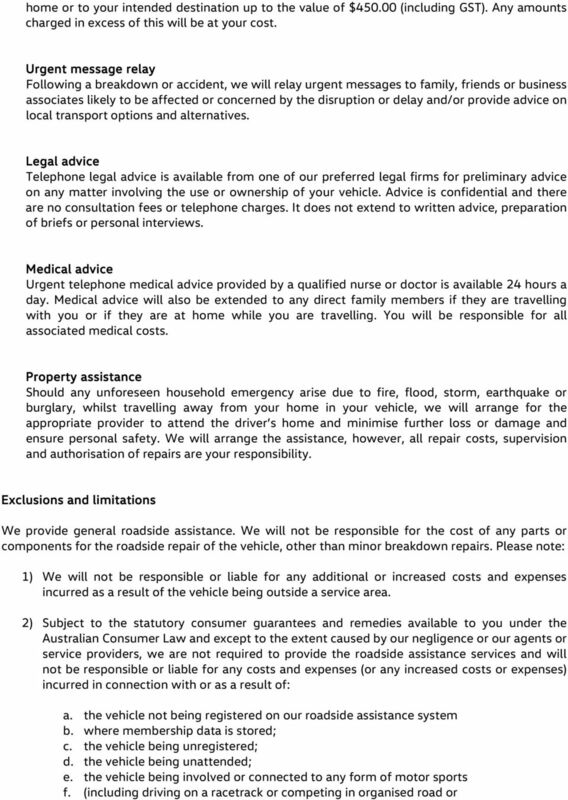 For a list of current Volkswagen Dealers and locations please visit What is not covered by Warranty Vehicles used for Taxi or Hire Car purposes are excluded from this Warranty. Repairs that do not fall under the term defects from manufacture such as: Wear and tear. Any parts that wear out as part of their normal operation (e.g. clutch linings, brake discs and pads, brake linings, wiper blades, globes of all types (including Bi Xeon and LED), fuses, trims brakes, diesel particulate filters, catalytic converters, all belts, tyres, wiper blades, spark plugs, filters, Satellite Navigation update disks and all other parts of your vehicle that have been subject to normal wear and tear). Motorsport. Any parts that have been influenced by any form of motorsport such as racing, track days, hill climbing and rallying or similar activities. Modifications. 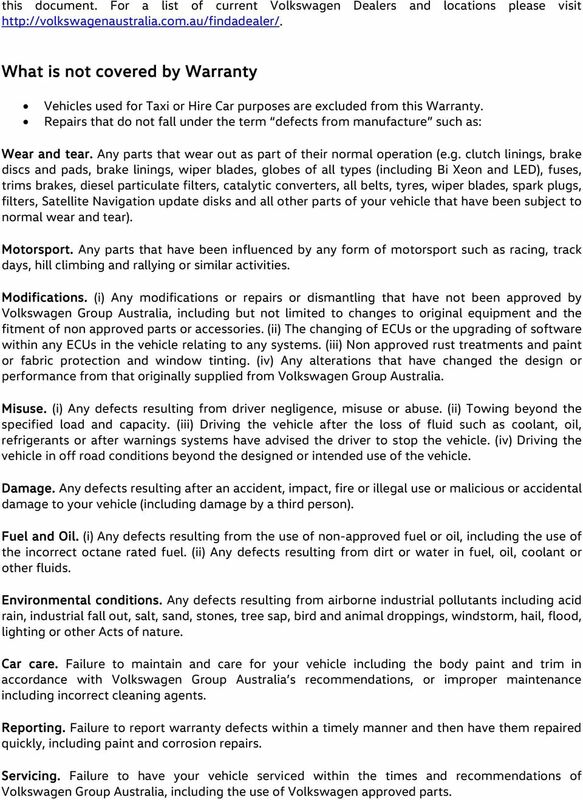 (i) Any modifications or repairs or dismantling that have not been approved by Volkswagen Group Australia, including but not limited to changes to original equipment and the fitment of non approved parts or accessories. (ii) The changing of ECUs or the upgrading of software within any ECUs in the vehicle relating to any systems. (iii) Non approved rust treatments and paint or fabric protection and window tinting. (iv) Any alterations that have changed the design or performance from that originally supplied from Volkswagen Group Australia. Misuse. (i) Any defects resulting from driver negligence, misuse or abuse. (ii) Towing beyond the specified load and capacity. (iii) Driving the vehicle after the loss of fluid such as coolant, oil, refrigerants or after warnings systems have advised the driver to stop the vehicle. (iv) Driving the vehicle in off road conditions beyond the designed or intended use of the vehicle. Damage. Any defects resulting after an accident, impact, fire or illegal use or malicious or accidental damage to your vehicle (including damage by a third person). Fuel and Oil. (i) Any defects resulting from the use of non-approved fuel or oil, including the use of the incorrect octane rated fuel. (ii) Any defects resulting from dirt or water in fuel, oil, coolant or other fluids. Environmental conditions. Any defects resulting from airborne industrial pollutants including acid rain, industrial fall out, salt, sand, stones, tree sap, bird and animal droppings, windstorm, hail, flood, lighting or other Acts of nature. Car care. 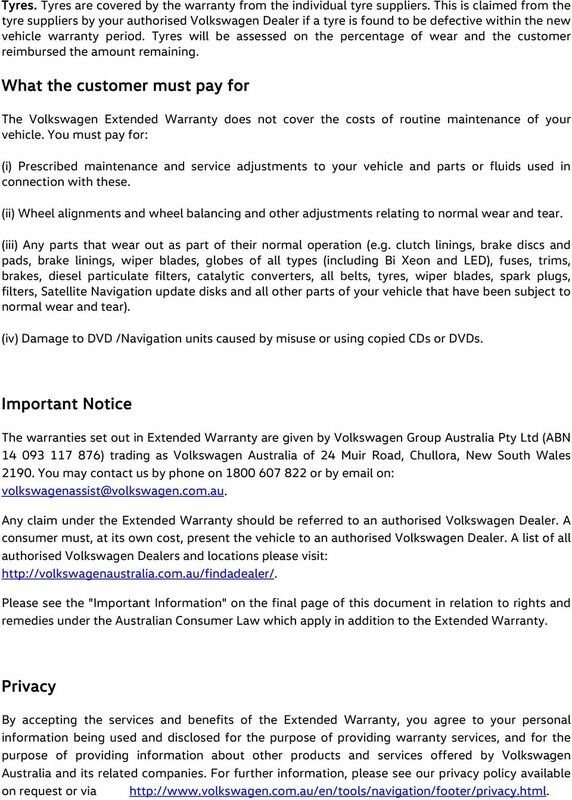 Failure to maintain and care for your vehicle including the body paint and trim in accordance with Volkswagen Group Australia s recommendations, or improper maintenance including incorrect cleaning agents. Reporting. Failure to report warranty defects within a timely manner and then have them repaired quickly, including paint and corrosion repairs. Servicing. Failure to have your vehicle serviced within the times and recommendations of Volkswagen Group Australia, including the use of Volkswagen approved parts. 5 Roadside Assistance Terms and Conditions Volkswagen Roadside Assist offers reliable and secure roadside assistance 24 hours a day, 365 days a year. 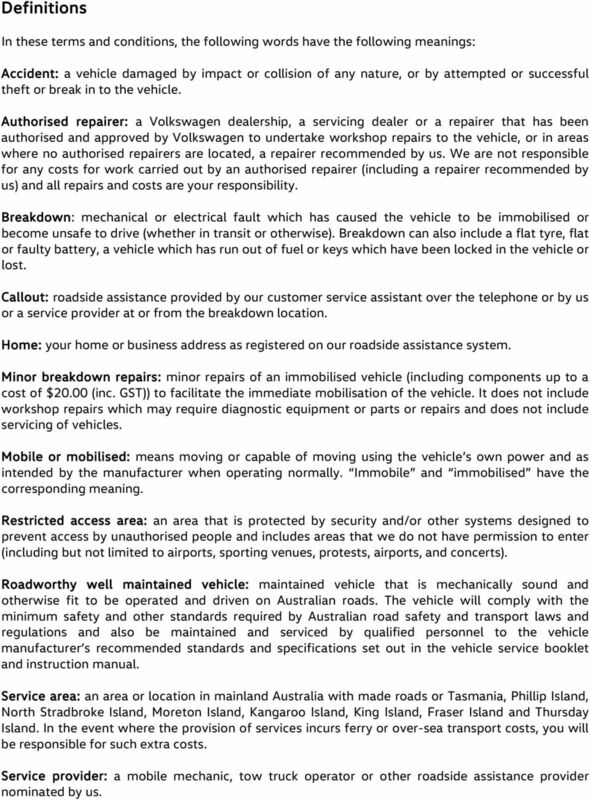 Volkswagen Roadside Assist comprises the tele-assist and roadside assistance services set out in this section. 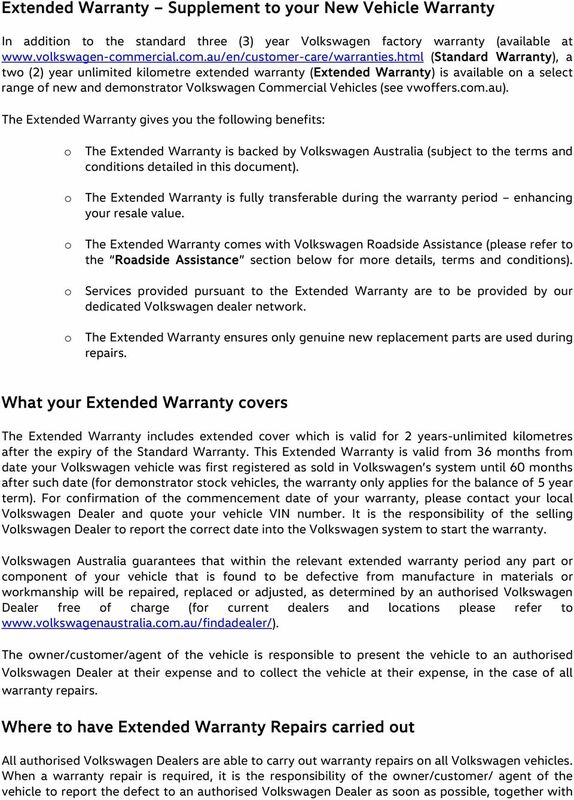 Volkswagen Roadside is provided during the term of your Extended Warranty. To access Volkswagen Roadside, simply call us on Please have the following information ready when you call: Your name and telephone number Your breakdown location (stating the nearest cross street where possible) Your membership number and expiry date Your vehicle registration number A description of the problem Important notice Volkswagen Roadside Assistance is provided by AGA Assistance Australia Pty Ltd ABN trading as Allianz Global Assistance (Allianz Global Assistance) of 74 High Street, Toowong, Queensland Whenever you request roadside vehicle assistance under your membership, you will be making that request to Allianz Global Assistance, who will provide the services on the terms and conditions set out below. The terms and conditions contain exclusions and limitations. 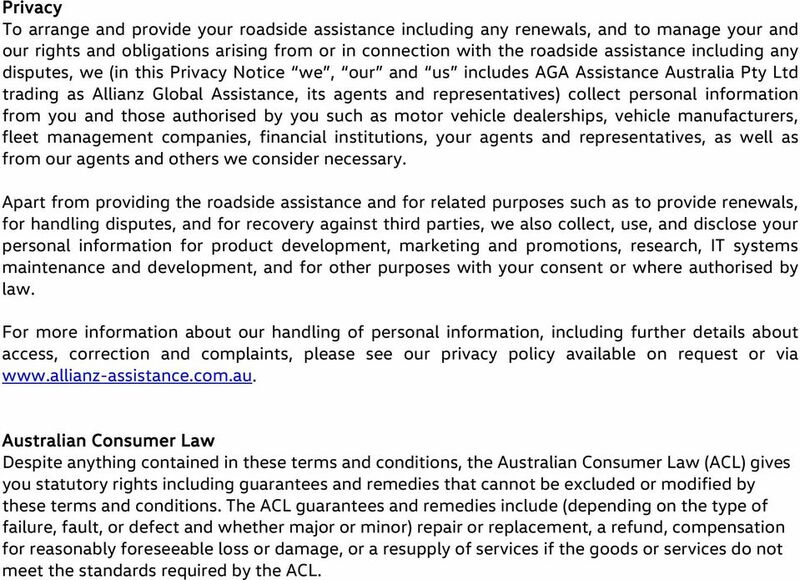 Please see the "Important Information" on the final page of this document in relation to rights and remedies under the Australian Consumer Law which apply in addition to the Volkswagen Roadside Assistance. Eligibility criteria In order to be eligible for roadside assistance, your vehicle must be a roadworthy well maintained vehicle. If your vehicle is not a roadworthy well maintained vehicle, we may still arrange a roadside assistance provider to service your callout but we will inform you of the cost that will be charged to provide you with assistance. This cost will be your responsibility. Please stay with your vehicle Once a roadside service provider has been called, it is important that you remain with your vehicle if it is safe to do so. Should we arrive at the scene of the breakdown and the vehicle is unattended, we will be unable to a carry out any work and payment may be required for any subsequent callouts to assist with the same incident. If you require assistance and have to leave your vehicle for safety reasons, please advise the customer service assistant at the time of the initial call. Tele-Assist Once our customer service assistant receives your call, we will provide general advice about the operation of your vehicle. If your vehicle is immobilised, we will provide an over the phone diagnosis (where possible) to get your vehicle mobilised. 12 Definitions In these terms and conditions, the following words have the following meanings: Accident: a vehicle damaged by impact or collision of any nature, or by attempted or successful theft or break in to the vehicle. Authorised repairer: a Volkswagen dealership, a servicing dealer or a repairer that has been authorised and approved by Volkswagen to undertake workshop repairs to the vehicle, or in areas where no authorised repairers are located, a repairer recommended by us. We are not responsible for any costs for work carried out by an authorised repairer (including a repairer recommended by us) and all repairs and costs are your responsibility. Breakdown: mechanical or electrical fault which has caused the vehicle to be immobilised or become unsafe to drive (whether in transit or otherwise). Breakdown can also include a flat tyre, flat or faulty battery, a vehicle which has run out of fuel or keys which have been locked in the vehicle or lost. Callout: roadside assistance provided by our customer service assistant over the telephone or by us or a service provider at or from the breakdown location. Home: your home or business address as registered on our roadside assistance system. 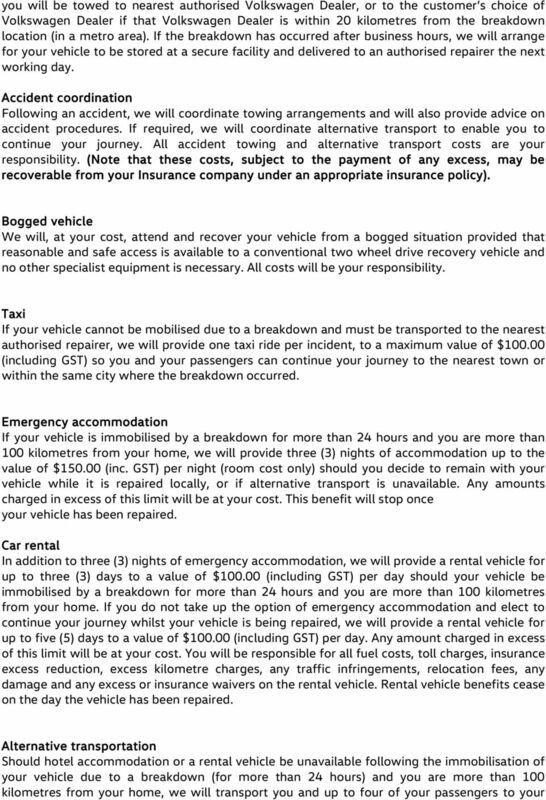 Minor breakdown repairs: minor repairs of an immobilised vehicle (including components up to a cost of $20.00 (inc. GST)) to facilitate the immediate mobilisation of the vehicle. It does not include workshop repairs which may require diagnostic equipment or parts or repairs and does not include servicing of vehicles. Mobile or mobilised: means moving or capable of moving using the vehicle s own power and as intended by the manufacturer when operating normally. Immobile and immobilised have the corresponding meaning. Restricted access area: an area that is protected by security and/or other systems designed to prevent access by unauthorised people and includes areas that we do not have permission to enter (including but not limited to airports, sporting venues, protests, airports, and concerts). Roadworthy well maintained vehicle: maintained vehicle that is mechanically sound and otherwise fit to be operated and driven on Australian roads. 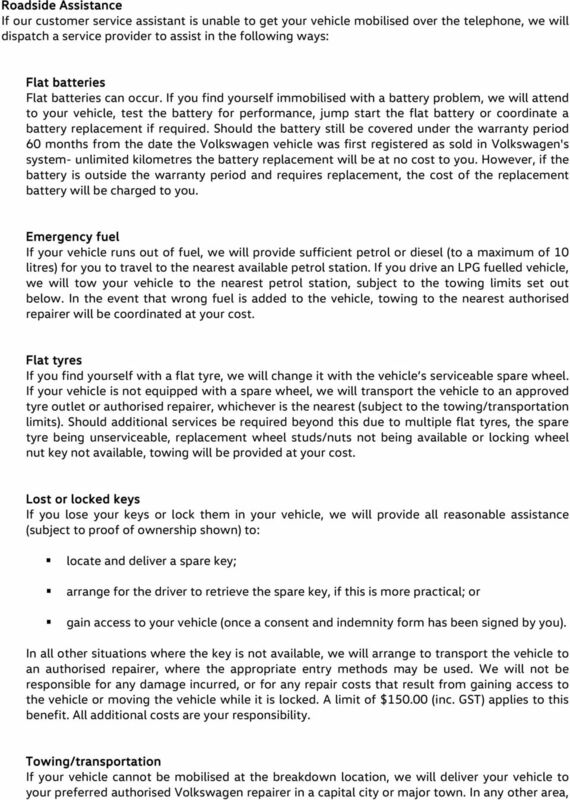 The vehicle will comply with the minimum safety and other standards required by Australian road safety and transport laws and regulations and also be maintained and serviced by qualified personnel to the vehicle manufacturer s recommended standards and specifications set out in the vehicle service booklet and instruction manual. Service area: an area or location in mainland Australia with made roads or Tasmania, Phillip Island, North Stradbroke Island, Moreton Island, Kangaroo Island, King Island, Fraser Island and Thursday Island. In the event where the provision of services incurs ferry or over-sea transport costs, you will be responsible for such extra costs. 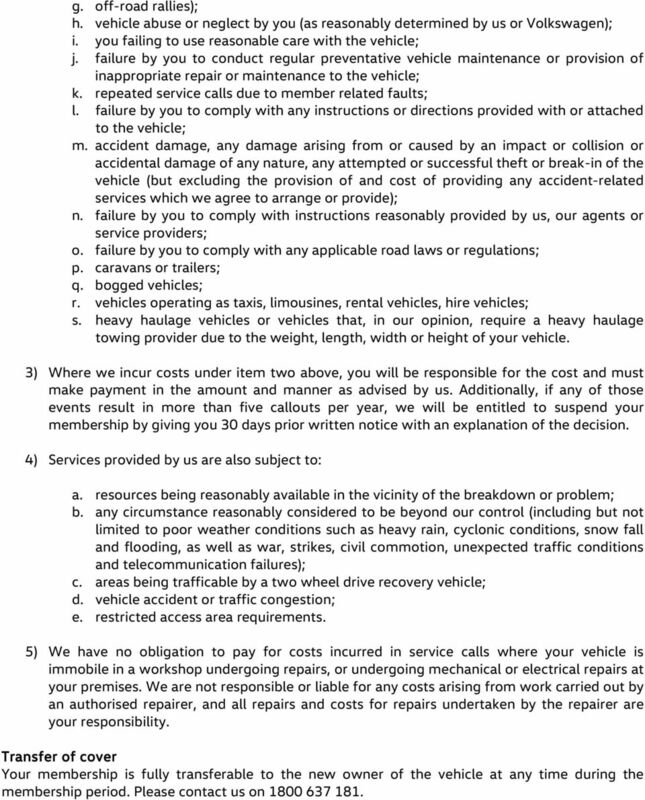 Service provider: a mobile mechanic, tow truck operator or other roadside assistance provider nominated by us. 13 Serviceable spare: a wheel and tyre that is ready and able to be fitted to mobilise your vehicle after changing a flat tyre. Vehicle: your nominated vehicle registered on our roadside assistance system. 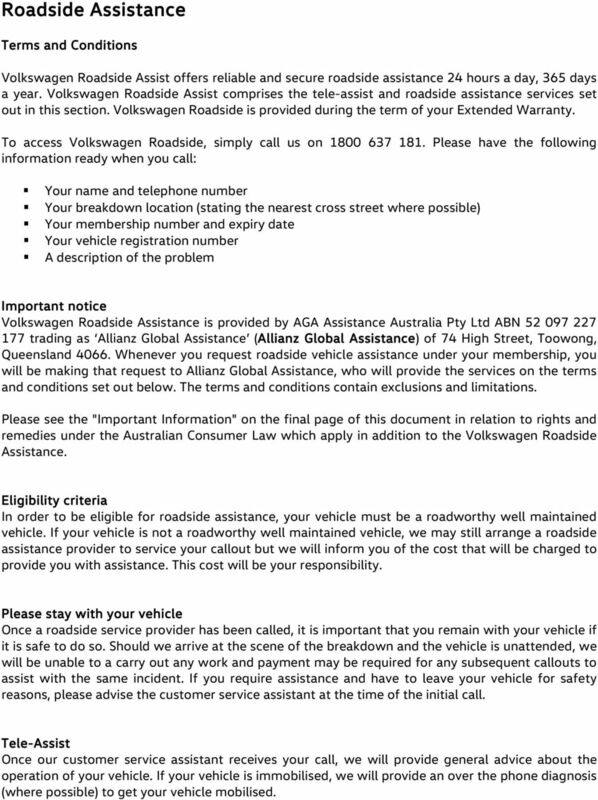 Volkswagen: Volkswagen Group Australia, 24 Muir Road, Chullora, NSW, 2190 We or us or our: Allianz Global Assistance, our employees, agents, contractors, and related companies. You or your: the Volkswagen Assist member. Ultra Care Welcome to Ultra Care It s great to have you on board! In choosing RACQ for Roadside Assistance, you ve joined more than a million people in Queensland who count on RACQ for help, day and night.